The regional integration of Northeast Asia is far behind other regions.Recent developments on the Korean Peninsula offer the possibility of a trajectory toward integration. Any regionalization would be in Mongolia’s national interest.Mongolia’s material contribution to regional integration would be limited. 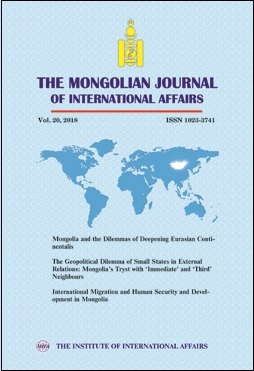 However, Mongolia could contribute greatly to the regionalization processes We highlight such process contributions: (1) the provision of neutral ground for dialogue between conflicting parties; (2) hosting peacekeeping and disaster-relief exercises; (3) promoting non-governmental connections; and (4) serving as an example for political and economic transition. If US-DPRK negotiations result in positive steps, Mongolia could contribute expertise in the establishment of a nuclear-weapon free zone.